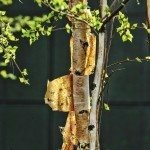 What is all over the bark of my fruit trees? I have a flower like, gray fungus all over the bark of my fruit trees and a light green something that resembles a small tree. What are they and how do I get rid of it?